Kilkea Castle is a splendid medieval castle, located near the Irish village of the same name. Kilkea is located about 80 kilometers from Dublin and 5 miles northwest of another interesting landmark in the world of the Irish County of Kildare. Kilkea Castle was built by Sir Walter de Riddlesford in 1180-1181, who was also the first inhabitant of the fortress. This palace is the only oldest inhabited building in the territory of Ireland. Like most medieval castles, castle Kilkea has a rich, but also terrifying story involving violence and wars over the centuries. Only three generations of the Riddlesford family inhabited the castle before the last of their kind died and left no heir. Then, Kilkea was inhabited by many lords, archbishops and their families. As the oldest inhabited castle in Ireland, today the renovated and elegantly furnished building of Kilkea draws inspiration from tradition and offers it guests and visitors unforgettable moments. 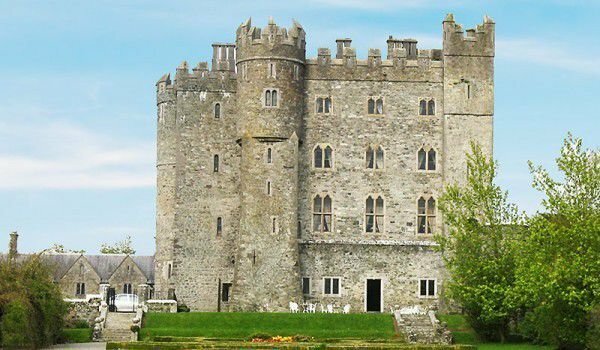 Kilkea Castle has hosted lavish banquets and a number of medieval celebrations, but today is the perfect place to celebrate a fairytale wedding. The organizers and staff of Kilkea create excellent conditions for the celebration of all family celebrations, banquets, etc., and the medieval rooms of the castle are now housing a luxury hotel. The history of Kilkea for centuries was bound to exacerbate rather ominous battles and events which in turn have created excellent conditions for many legends and stories about ghosts living in the palace. One of the inner walls of Kilkea chills the blood of visitors as sculptured on it is, The Stone of devil eyes. This stone figure has been carved at a height of 17 feet. Furthermore, through the halls of the Kilkea Castle there are several ominous figures, one of which is the blood thirsty head of a wolf, which has, however, a human body dressed in colorful medieval clothing.